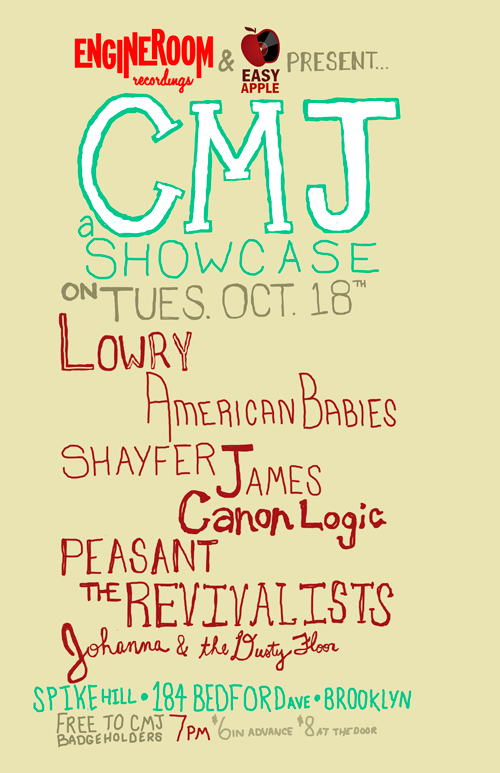 News :: Engine Room Recordings Official CMJ Showcase! For our CMJ party this year we’ve partnered up with Easy Apple promotions to present an amazing lineup of bands for the opening night of CMJ. Please join us at Spike Hill this coming Tuesday night for Peasant, Shayfer James, Johanna & The Dusty Floor, Canon Logic, American Babies, Lowry and closing out the night is The Revivalists from New Orleans. Free to CMJ badge holders or $8 at the door, which works out to like a buck a band, can’t beat that. For set times and links to the bands visit the official facebook invite.